Read up on the radio for National Radio Day! Home > Blog > Read up on the radio for National Radio Day! Do you know what today is? It’s National Radio Day! If it wasn’t for radio, music certainly wouldn’t be what it’s become today! Radio has been around for so long, it may be surprising to realize that it hasn’t always been here. But it’s true—the radio wasn’t invented until 1895. In the age of the internet and HD screens, it might not seem like such a fantastic invention anymore. But if you start learning about it, you’ll begin to see that so much of our modern technology relies on radio waves! Most wireless technology today uses them: internet, cell phones, they’re even used for satellite communications. While there were many contributing scientists who all played a part in this invention, there is one of them who stands out of the crowd. Rarely given the credit he deserves, I think it’s only fair that we cede the invention of the radio to one Mr. Nikola Tesla. It may have been the German scientist Heinrich Hertz who proved that radio waves exist and are naturally-occurring. And it was Gugliemo Marconi who invented the wireless telegraph using radio waves while experimenting in the attic of his parents’ house. 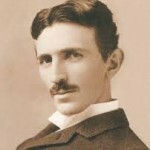 But it was Tesla who invented the standard means of transmitting radio signals through the air. And that wasn’t the only thing this guy did—he also invented alternating current for the light bulb (which is what we use today—not the direct current that Thomas Edison wanted everyone to use!). Vastly beyond his time, the people of the early 1900s didn’t really know what to make of Tesla. 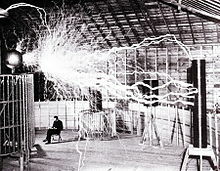 His Tesla coil was a bit of a scary image and he had ideas of tapping into the earth’s ionosphere, granting free electricity to the entire world. If people had listened to Tesla, we wouldn’t need to plug our toasters in, they’d just use the freely flowing supply of electricity! Check out more about Tesla in the video underneath. A happy Radio Day to all and thanks for reading!